The term “disturbing” gets thrown around quite a bit when describing a particular type of film. Type “disturbing films” into google and the search will yield countless websites and their “top [insert number here] disturbing films of all time” or of “so and so decade.” I’ve seen my fair amount of skin tingling, uneasy films often featured on these lists such as Visitor Q, Salo: 120 Days of Gomorrah, Audition, I Spit on Your Grave, Antichrist, and Pink Flamingos among others. These film’s status is usually fitting due to their graphic nature and pitting audiences through uncomfortable acts of torture and assault. However, when taking into account the definition of something disturbing as: to destroy the sleep or relaxation of, there’s only a handful of film that have personally stood out as genuinely disturbing and not just shock value. First and foremost, Salo, a film that I have only watched once despite owning with no intention of ever watching again, and now Battle Royale. Dystopianism and desperation for survival against one another has always been a horrifying thought process constantly running through my mind. It’s been ingrained in me since childhood that human beings are the most dangerous, terrifying beings in existence; a requirement of reading books like The Most Dangerous Game and Lord of the Flies in grade school reminded me of that. Lord of the Flies left a lasting impression on me as it told the heartbreaking story of a group of boys trapped on an island resulting in them reverting to the savage ways of their ancestors for survival with the story ending after a beloved character dies because of it. 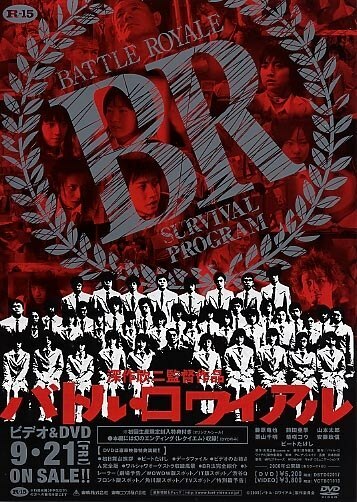 While watching Battle Royale I was constantly reminded of those terrifying grade school thoughts as Battle Royale mixes elements from both of the aforementioned titles, but with a brutal violence that only Japan can do so well in films. Battle Royale is much more sinister and brooding in its delivery, not to mention heavily cringe-worthy and gory. However, it’s the story that makes Battle Royale so chilling to watch. Battle Royale follows the life of Shuya Nanahara, a Japanese middle school orphan. The economy has taken a nose dive, many parents across the country took their own lives seeing no hope for the future leaving their angst ridden children behind. With little to no supervision, the youth of Japan have run wild, ditching school and started dangerous trouble. Fed up with the behavior, the government enacts “Battle Royale,” a program that pens 40 students at random and deserts them on an island with three days to kill each other before a neck bomb is detonated if more than one person is left standing on the last day. To make the game more interesting, students are given weapons to aid in their survival, however, not all are useful. Some students receive guns, knives, and tasers while others get pot lids, binoculars, or tracking devices. Frightened and desperate for survival, the students become ravishing animals despite attempts to make peace and labor on. Shuya must find a way off the island and help the ones closest to him. In just two hours audiences are introduced to nearly 40 different characters whom with some we explore their personal background, desires, goals, fears and willingness to either live or die on the island and that’s one of the major reasons the film is just so brutally captivating. Through anecdotes and great moments of character interaction enough is learned of certain individuals that audiences are able to relate to the personalities assigned to each character making the deaths of likable ones all the more soul crushing and unwarranted. Secrets about one another is revealed, love is confessed, friends are betrayed and ultimately the desperation for survival and fate put some at the tragic mercy of others. Battle Royale doesn’t hold back. In its first few minutes we are introduced to death and from then on the film constantly revisits the topic never truly desensitizing viewers to its violence because of the sheer number of ways in which characters meet their deaths, making the entire film watching experience stressful. I realized numerous times throughout that I was involuntary holding my breath in shock of what was happening or had just previously taken place. Once characters meet their death, a reminder is not too far away showcasing their name and body count which reminds both characters and viewers of how many more deaths are left to endure. Each time the scenes faded out moving on the next I found myself sighing in exasperation as to what was going on. I also had to stop the film numerous times to gather my thoughts and get through what was taking place. It shocks me that Battle Royale has been an easy movie to get through for most people. I’ve had countless friends tell me of its quality and entertainment purposes assuring me I needed to see it. But no one ever mentioned how truly disturbing the story and method of story telling is and seeing as I’ve never even seen it mentioned on at the top of a “disturbing list,” I wonder why so many people can watch it and move on. I’ve read about countless tragedies and have researched major atrocities in the world for my own learning experience. I was a kid who used to card catalog stories and statistics of abuse in elementary school. To this day, I own countless books chronicling each known serial killer in modern existence because it interests me. Yet of all these things I’ve seen and read about, the idea of being forced into a situation like the one in Battle Royale haunts me. Perhaps it’s because it’s a film that does an exceptional job of exploring human desperation as well as apathy and the will to survive. Also actually seeing character’s heads explode or pump bullets into each other while the leaders making them do it sit in cold apathy enjoying the massacre just gives me the heebeejeebees. There’s a genuine fear that arose from watching Battle Royale as I have no hope or optimism for humanity in times of desperation. Call me a cynic, but if technology crashed and humans were left to their own vices, I think we’d all kill each other in a matter of days. SEE IT. And fear humans and the collapse of society more than you may already do. I found this review quite interesting, because despite having seen this film several times and loving it, I have always seen it as campy fun. When I think of disturbing films that give me an unsettling feeling in my stomach, I think of Salo and Antichrist, which you both mentioned, Irreversible, or the recent documentary Act of Killing. For me, Battle Royale is so far away in another category! You do make good points, and I certainly do not disagree with the reasons you mentioned for this film being disturbing, but I find it interesting that people can totally see this film in different ways. I particularly love the video that they are forced to watch with the woman explaining the rules! The reverse has happened to me as well, where I found a film extraordinarily disturbing, while others didn’t. An example would be Black Swan, which I almost couldn’t make it through. My wife still doesn’t understand why I found it so unsettling. Yet, I can handle films like Salo or Martyrs, which she could never make it through. Thank you so much for the comment! It truly is interesting how people read films differently., which is why I love engaging with others about films. I love how me how each person’s own experiences through life project various meanings on media. I’d definitely put Battle Royale on par with The Act of Killing, both movies put me in a weird, pessimistic place for a day or two after watching. But I completely understand why you, and others, didn’t see it in that cynical light that I did. That’s interesting that Black Swan affected you the way it did. I need to rewatch that film as I wasn’t impressed upon my first viewing. I would also like to check out Martyrs too, never heard of it before!